The water level in rivers is unusually low and those who make a habit of roving along streaming waters may see dippers; it is worthwhile to watch out near rapids. In summer just ten dipper pairs nested in Estonia and bird enthusiasts know their movements. Migrants arriving from the north and east have been seen and in rapidly flowing river stretches that will not freeze a couple of hundred birds stay for the winter, provided that the water is clear and transparent. The dippers winter singly. In severe winters several birds can be busy in the same rapids. On what and how do they feed? Insects, amphipods, water lice, caddisfly and dragonfly larvae, molluscs or leeches. Small, up to five centimetre long fish and fish roe – as known the salmon family fish river and sea trout spawn in gravelly rapids. For hunting in the water the dipper walks, jumping in from a riverside branch or stone. In shallow waters they turn small stones, under them there may be something edible. Diving, they hunt small fish. They spend the night in hollows in the banks, hidden from enemies. In the north small shelters are set out in river banks – why not try here? 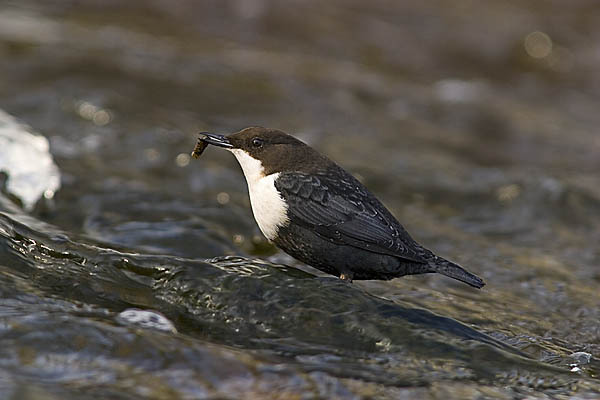 It is quite exciting to watch a dipper’s doings if a place for them is known.